Prior to immigrating to the United States from Israel, Judge Meron was a member of the Israeli Foreign Service. His duties included that of Legal Adviser to the Foreign Ministry and that of Ambassador to Canada and to the United Nations in Geneva. Since 1977, Judge Meron has been a Professor of International Law and, since 1994, the holder of the Charles L. Denison Chair at New York University Law School. In 2000-2001, he served as Counselor on International Law in the U.S. Department of State. Between 1991 and 1995 he was also Professor of International Law at the Graduate Institute of International Studies in Geneva, and he has been a Visiting Professor of Law at Harvard and at the University of California (Berkeley). He received his legal education at the Universities of Jerusalem, Harvard (where he received his doctorate), and Cambridge. 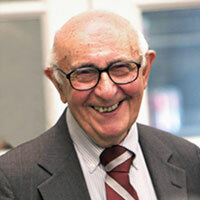 In 2006, he was named Charles L. Denison Professor Emeritus and Judicial Fellow at the New York University Law School. He was Co-Editor-in-Chief of the American Journal of International Law (1993-98) and is now an honorary editor. He is a member of the Board of Editors of the Yearbook of International Humanitarian Law, a member of the Council on Foreign Relations, the American Society of International Law, the French Society of International Law, the American Branch of the International Law Association, the Bar of the State of New York, and of the Shakespeare Institute. He has served on the advisory committees or boards of several human rights organizations, including Americas Watch and the International League for Human Rights. In 1990, he served as a Public Member of the United States Delegation to the CSCE Conference on Human Dimensions in Copenhagen. In 1998, he served as a member of the United States Delegation to the Rome Conference on the Establishment of an International Criminal Court (ICC) and was involved in the drafting of the provisions on crimes, including war crimes and crimes against humanity. He has also served on the preparatory commission for the establishment of the ICC, with particular responsibilities for the definition of the crime of aggression. He has served on several committees of experts of the International Committee of the Red Cross (ICRC), including those on Internal Strife, on the Environment and Armed Conflicts, and on Direct Participation in Hostilities Under International Humanitarian Law. He was also a member of the steering committee of ICRC experts on Customary Rules of International Humanitarian Law. He has been a Carnegie Lecturer at The Hague Academy of International Law, Fellow of the Rockefeller Foundation, Max Planck Institute Fellow (Heidelberg), Sir Hersch Lauterpacht Memorial Lecturer at the University of Cambridge, and Visiting Fellow at All Souls College, Oxford. He has lectured at many universities and at the International Institute of Human Rights (Strasbourg). He helped establish the ICRC/Graduate Institute of International Studies seminars for University Professors on International Humanitarian Law. He leads the annual ICRC seminars for U.N. diplomats on International Humanitarian Law at NYU, and in the past led such seminars in Geneva. He is a member of the Institute of International Law. He was awarded the 2004 Rule of Law Award by the International Bar Association and has been awarded for the 2006 Manley O. Hudson Medal of the American Society of International Law. He was made Officer of the Legion of Honor by the President of France in 2007. He has been selected for the Charles Homer Haskins Prize of the American Council of Learned Societies for 2008. His books are: Investment Insurance in International Law (Oceana-Sijthoff 1976); The United Nations Secretariat (Lexington Books 1977); Human Rights in International Law (Oxford University Press 1984); Human Rights Law-Making in the United Nations (Oxford University Press 1986) (awarded the certificate of merit of the American Society of International Law); Human Rights in Internal Strife: Their International Protection (Sir Hersch Lauterpacht Memorial Lectures, Grotius Publications 1987); Human Rights and Humanitarian Norms as Customary Law (Oxford University Press 1989); Henry’s Wars and Shakespeare’s Laws (Oxford University Press 1993); Bloody Constraint: War and Chivalry in Shakespeare (Oxford University Press 1998); War Crimes Law Comes of Age: Essays (Oxford University Press 1998), and International Law In the Age of Human Rights (Martinus Nijhoff 2004). His latest book “The Humanization of International Law” appeared in 2006 (Hague Academy of International Law and Nijhoff).